In the employment contract (and sometimes also in a board resolution depending on the location of the company) there should be a clear reference to the amount being paid to the employee under the title of each specific allowance. 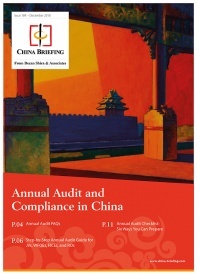 Each month the employee should produce evidence to show the company that this money was indeed spent on the services described in the contract; this is done using the ubiquitous “fapiao,” or official invoice, that should be received whenever an official monetary transaction is completed in China (in some cities, the name of the company must be clearly written on the fapiao for it to be permitted as a deduction). The amount spent on rental of an apartment may also be deducted. 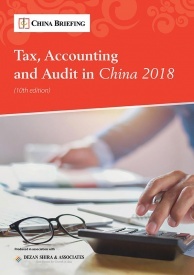 However please be aware that in China a private landlord will often be reluctant to issue an official fapiao because in order to obtain one, he/she must pay approximately 17 percent of the rental amount received to the Tax Bureau. If a fapiao is requested, the landlord will likely charge a large premium on top of the originally negotiated rental amount. Foreign employees that require a fapiao should negotiate this with the landlord before signing the rental contract. Fapiao issuance should be clearly mentioned in the agreement. Foreign employees living in a serviced residence will not have this problem – the residence will be managed by a company that can issue a fapiao. This is fairly self-explanatory – an allowance for the dry cleaning of clothes etc. Some of the cost of a foreign employee’s education expense for the studying of Chinese language or relating to the education of their children can be deducted. Note that the education must be received here in China, and as with the other allowances above, a fapiao must be received. Each year a foreign employee is allowed to deduct the cost of one or two return flights back to their home country (usually the cost of a ticket up to business class may be permitted). Note that flights to other destinations are normally not accepted. Cost of hotels and other expenses are also not accepted as this is considered a home visit allowance, not a vacation allowance. 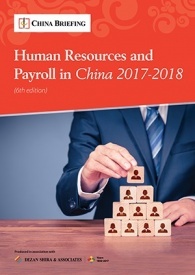 Portions of this article came from “Human Resources and Payroll in China (Third Edition)” which is available on the Asia Briefing Bookstore. 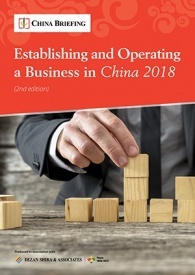 A firm understanding of China’s laws and regulations related to human resources and payroll management is essential for foreign investors who want to establish or are already running foreign-invested entities in China. 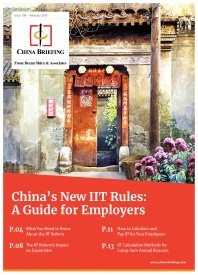 This guide aims to satisfy that information demand, while also serving as a valuable tool for local managers and HR professionals who may need to explain complex points of China’s labor policies in English. 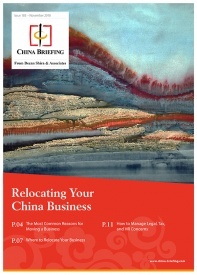 You can stay up to date with the latest business and investment trends across China by subscribing to Asia Briefing’s complimentary update service featuring news, commentary, guides, and multimedia resources. My employer paid the school fees for my children directly to the school. He now decides to give me my notice (termination without cause) and as this ends in the middle of the 2nd school semester the school will not refund any of the pre-paid annual fees. My employer now intends to deduct these fees from my severance payment. Is this legally allowed? @Mwdb: Whether your employer can legally deduct the school fee out of your severance payment depends on the labor contract. If the contract provides that the school fee is part of the employee benefits, your employer cannot deduct it from the severance payment. However, if there are no provisions regarding this in the contract, the employer may be able to deduct the school fee from your severance payment. 1. Meal allowances, what does “a certain amount” mean? I heared that its possible up to 5.000 RMD per month. Does it make a difference how many people live in your household.? 2. Home visit allowance: I get an allowance for me, my wife and my two children, Is the allowance limited to myself and the flights of my wife and kids will be taxed? Or are all flights included in the allowance? Last but not least, I heared that I have to pay tax on my private health insurance. @BVC: The employee welfare (including meal allowances and home visit allowance) shall not exceed 14 percent of the total amount of employee salaries and wages. You don’t have to pay tax for your home visit allowance but you are suggested to confirm the allowance coverage with your company’s HR department. And yes you will have to pay tax on your private health insurance. Hi, thanks for your comment. In law, 14 percent is the cap applies when a company deducting employee welfare from their taxable income. 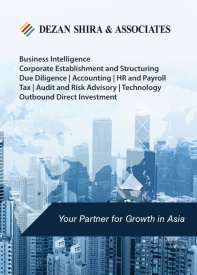 The policy can be very flexible and differ widely depending the company’s HR policy. Please confirm this with your HR manager. Hello, I have a question concerning school fees. My company give me a school fees allowance Wich is tax free but this allowance covered just 50% of the school fees so I pay the other 50% on my salary. Could I deduct this 50% from my monthly salary when I calculate my ITT?